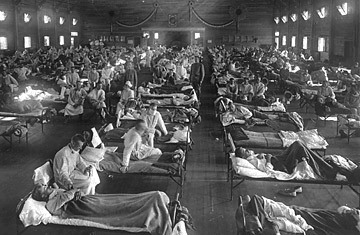 Influenza victims crowd into an emergency hospital near Fort Riley, Kansas in 1918. How Long Do Antibodies Last? Every year in the fall, physicians dispense a new flu vaccine. Typically it is designed to protect against the three flu strains that epidemiologists predict will be the most pervasive that season. But how often have patients received the flu shot, only to catch a bad illness anyway? The problem is that cold and flu viruses mutate so rapidly that sometimes they're unrecognizable to the antibodies created by the body in response to any particular vaccine. It turns out, however, that those antibodies  unlike those against illnesses like tetanus or whooping cough  can provide a formidable and life-long defense against the flu, as long as they're pitted against the correct strain. For an explanation, TIME asks Eric Altschuler, assistant professor of physical medicine and rehabilitation at the University of Medicine and Dentistry of New Jersey, and co-author of a recent paper in Nature about antibodies to the 1918 pandemic flu virus. Q: How long do flu antibodies last? A: According to our study, it appears they can last the entire lifespan of the human organism  90 years plus. In our study we were looking for antibodies to the 1918 flu. This flu virus was reconstructed a number of years ago in the lab, so we were able to test to see if 90 years later we could still find antibodies. I recruited survivors, people who were born in 1915 or earlier and thus presumably survived the 1918 flu. We found that virtually all the people born in 1915 or earlier  about 90% of them  had good "titers" to the 1918 flu, which means they still had reasonably high concentrations of the antibodies in their blood, whereas among controls, people who were born in 1926 or later, it was only about 10%. That was really quite a remarkable finding. The important question in this study is whether the antibodies still work after all that time, and I think my colleagues really found some very decisive results. I sent the blood samples from the survivors to my colleagues, Chris Basler at Mount Sinai, who's a professor of microbiology, and James Crowe at Vanderbilt, who's in pediatrics, microbiology and immunology. Dr Crowe and his colleagues at Vanderbilt isolated five different antibodies to the 1918 flu. Then Dr. Basler and colleagues looked at how those antibodies bind to the virus. It was quite strong and specific. We tried to compare it to other viruses, studying, for example, whether the antibody would bind to the flu of 1999 or to earlier ones, like the 1943 flu. Most antibodies bound to 1918, and only 1918. One of them bound, but much more weakly, to a couple of others. So that was really quite good evidence, we thought. I think the most definitive experiment we did was in mice. If you give mice the 1918 influenza, it kills them quite rapidly. It's very lethal. Terry Tumpey at the Centers for Disease Control and Prevention infected mice with the various strains that made up the 1918 flu. Then we treated the mice either with our five antibodies or with controls. (There were two controls. One was human gamma globulin, which are just pooled antibodies that bind to a lot of different things. The other was the antibody to one of the modern bird flus.) And all of the control-treated mice, whether they got the gamma globulin or the bird-flu antibody, they all died. All of those mice died. Meanwhile all the mice that were treated with the highest doses of our antibodies survived. That's really very strong evidence  the strongest  that these antibodies are functional against this virus. I think that diseases, other viruses and other pathogens, can behave differently. Antibodies are made by something called memory B cells, and the memory B cells for the 1918 flu clearly live for the lifespan of the human organism, which is wonderful. It raises important questions for looking at other pathogens, however, and it's important to try to look at these questions for different pathogens individually. Evidence shows it's important to get a regular tetanus booster, for example. Still, our new study may suggest another angle to look at things, which is how long do memory B cells last for this or that? Maybe there's some underlying biology that could explain why one thing might last longer than another.